All white wedding flowers are beautiful, but it can become so dull! 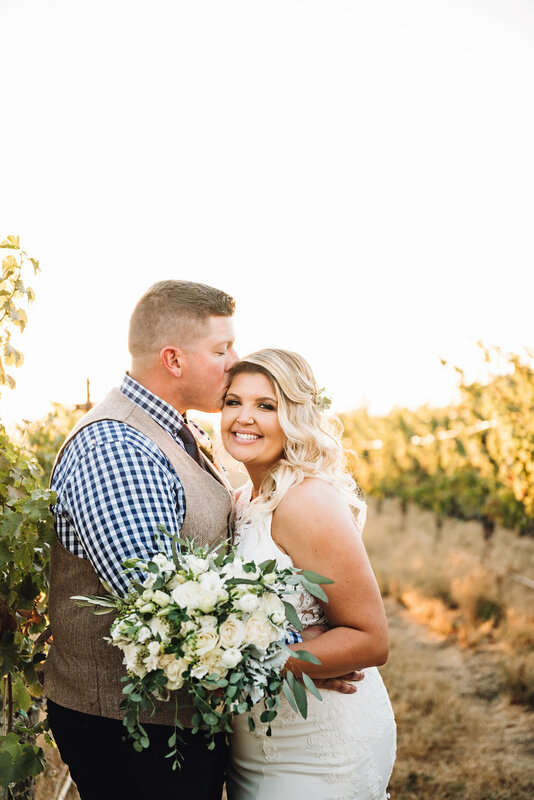 We love the pops of color to add some fun style to this glamorous winery wedding. 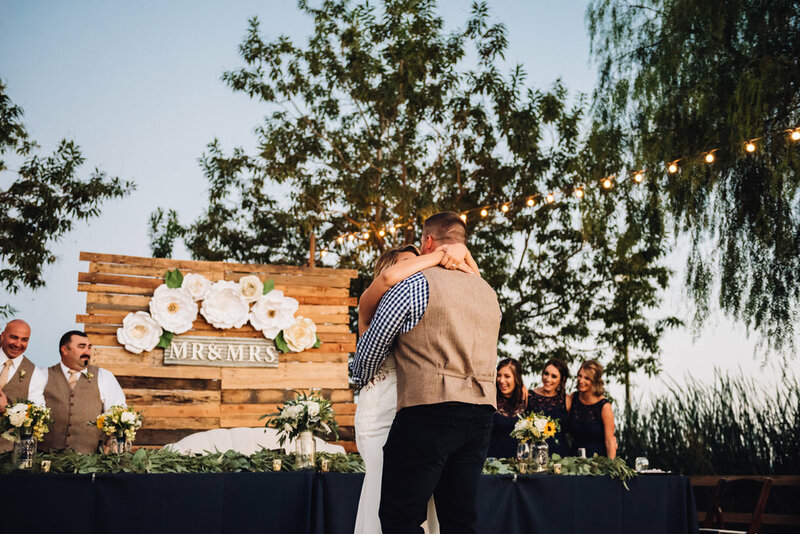 Hannah Nicole Vineyards & Winery in Brentwood, California is a beautiful outdoor venue perfect for a spring, summer, or autumn wedding. Our bride's bouquet was a loose with some control arrangement of white roses, lisi with buds, with greenery. 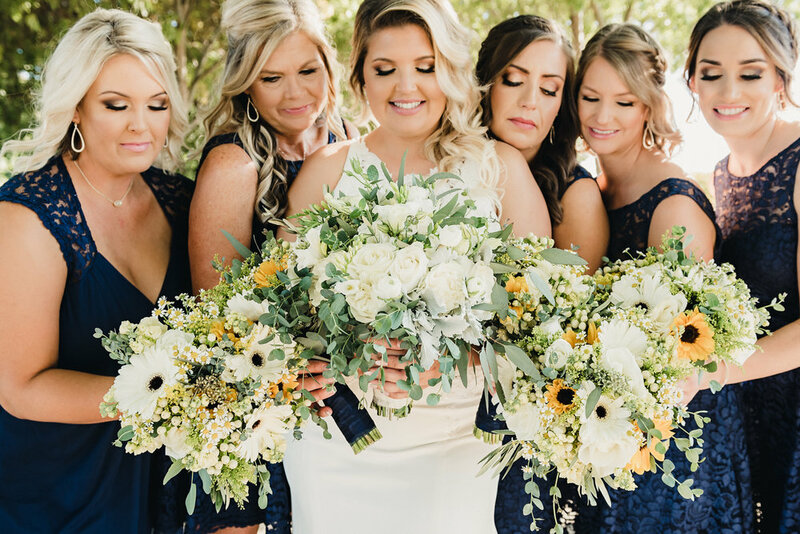 The bridesmaid bouquets were smaller versions of the brides, adding in small sunflowers and daisies. The groom’s boutonniere was a white freesia, with olive and eucalyptus. 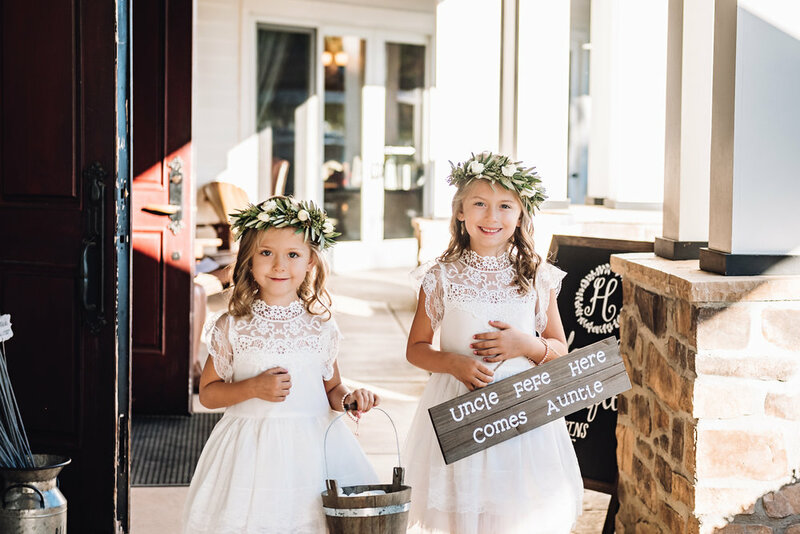 Both of the flower girls had princess crowns with olive, eucalyptus, and white tea roses. At the ceremony, we placed arrangements on top of barrels at the altar. These were arranged a bit more obscure with drippy greenery, using bridal blooms of whites and yellows, adding sunflowers. 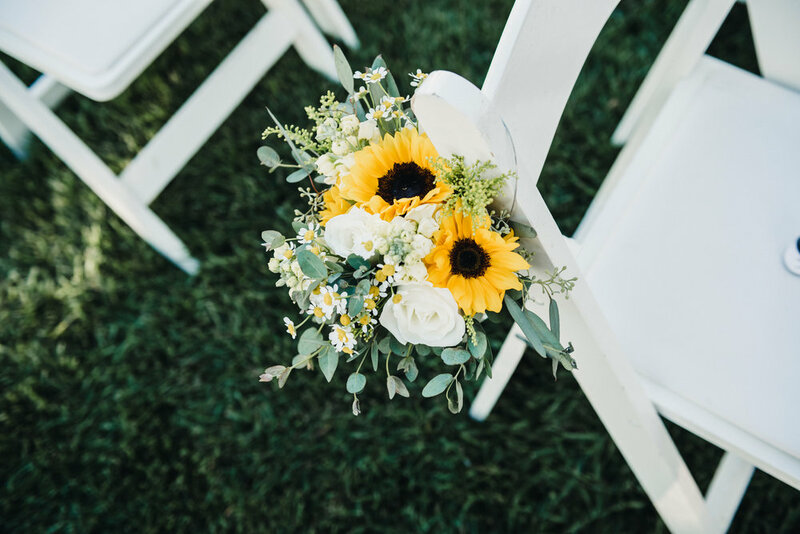 On the pews, we placed hanging jar arrangements filled with white roses, small sunflowers, daisies, and lots of greenery. 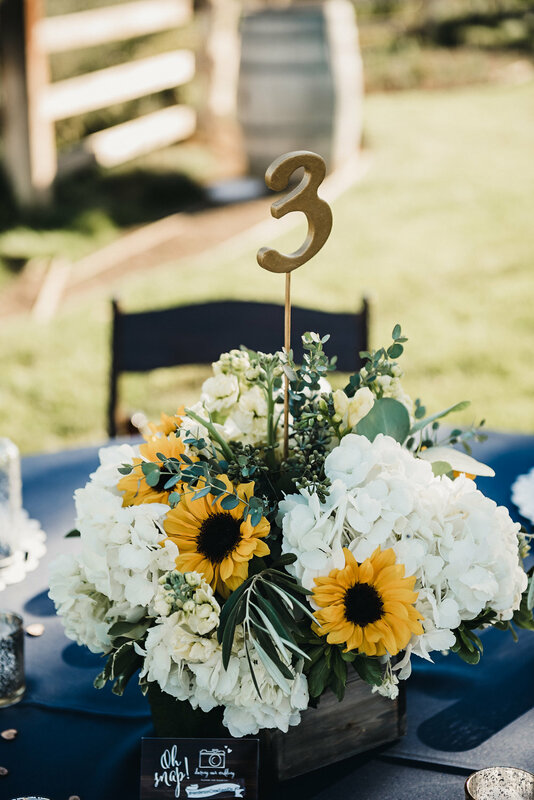 The reception centerpieces were arranged in a small wood box with white hydrangea, pale yellow, and sunflowers with greenery. We love a wedding that incorporates fun pops of color! 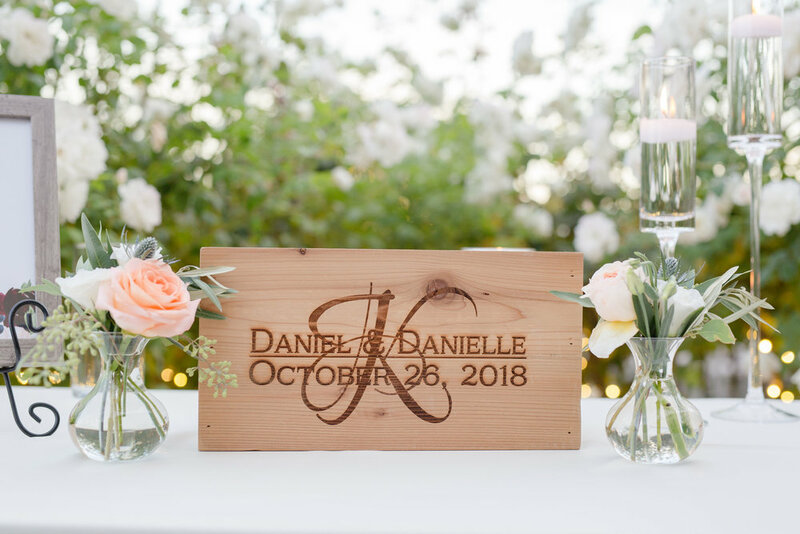 This enchanting affair was held at The Palm Event Center located in the beautiful vineyards of Pleasanton, California. 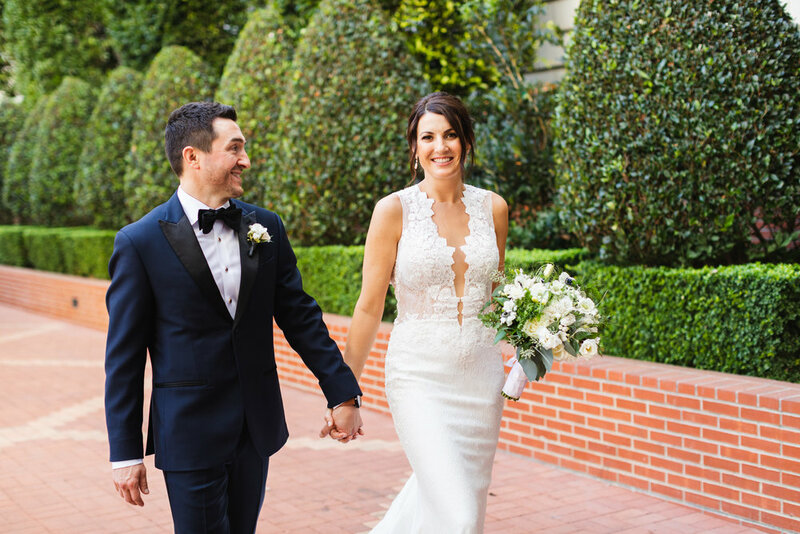 Our beautiful bride envisioned a wedding with hues of her glamorous rustic style. For her bouquet, we arranged garden roses, thistle, and wine dahlias, with hints of olive and seeded eucalyptus. The bridesmaids had a smaller version of the bride’s bouquet. At the ceremony’s altar, we placed two large floral arrangements on top of barrels to enhance the rustic vibe. These arrangements were made using peach garden roses, white tea roses, and merlot dahlias, with lots of greenery. Some reception centerpieces were loose, low lush arrangements using the same florals as the other arrangements. 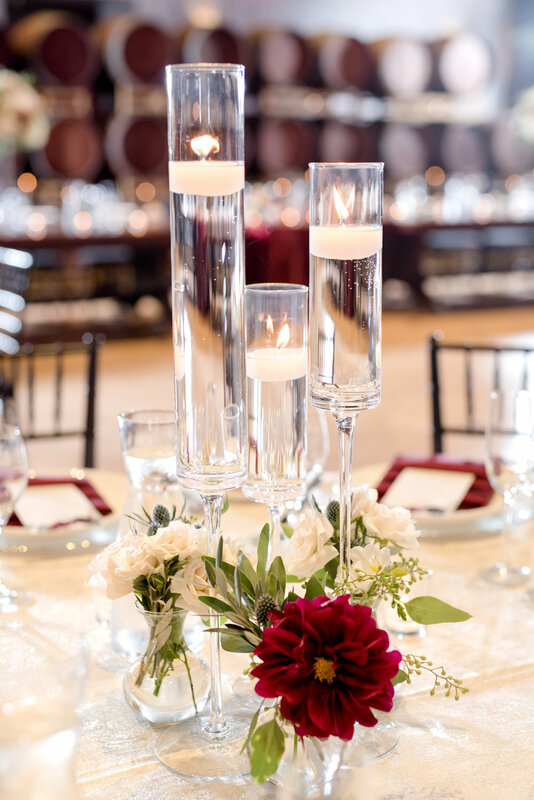 On other tables, we placed small bud vases with tea roses and dahlias surrounded by romantic floating candles as the centerpieces. Lastly, we topped off the wedding cake with peach, white, and merlot colored blooms. The Ritz Carlton Hotel in San Francisco is the perfect combination of elegance and vintage beauty, with so much beautiful natural lighting! Our brides bouquet was a perfect pairing of roses, anemones with black center, and brovardia, with hints of ruscus and eucalyptus. 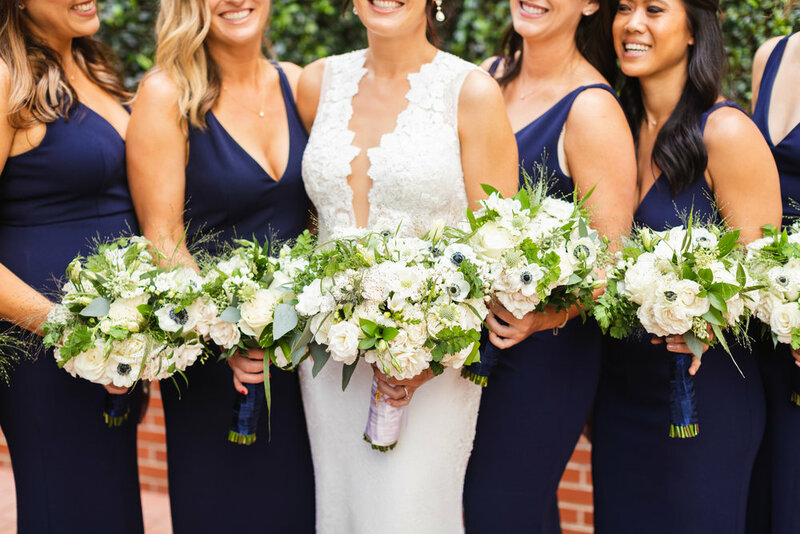 The bridesmaid bouquets were smaller versions of the brides, wrapped in a navy satin and chiffon ribbon. The grooms boutonniere was put together using off white tea rose, with accent of different textures, and hints of ruscus. At the altar, we placed two different sizes centerpieces sitting in hourglass vases on glamorous ivory pedestals. The pews were decorated with darling hanging jar arrangements using white bridal blooms. 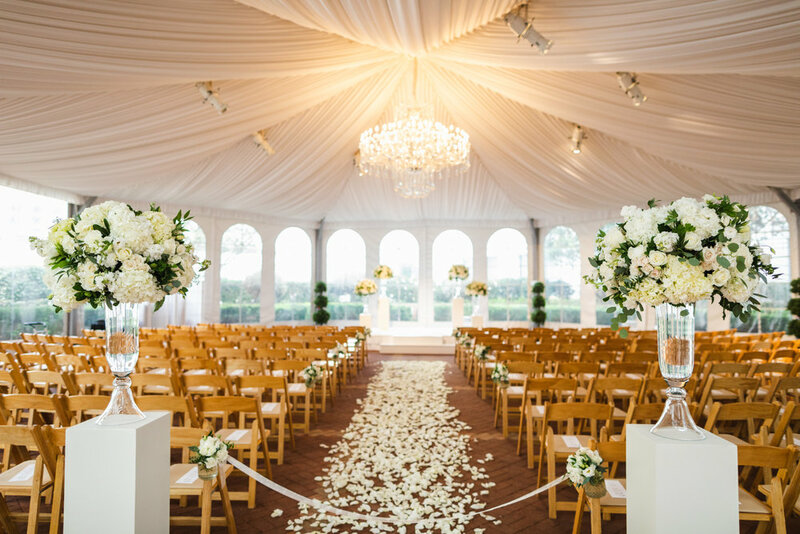 The aisle was covered in soft white rose petals. At the reception, we had two types of centerpieces. One was a large textured arrangement sitting on a gold stand using white bridal flowers and pops of greenery. The other centerpieces were small low lush arrangements sitting in a gold footed dish, using the same bridal flowers as the other arrangements. At the place card table, we had an arrangement similar to the large reception centerpieces, but much more dramatic with greenery dripping down.